This afternoon I went over to Inside Out Sports to ride some bikes. 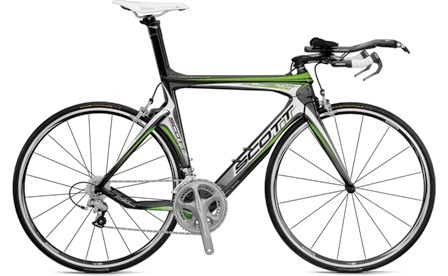 Yup, your's truly may finally catch up with the rest of the triathlon world and be on carbon soon. Here's the thing, I have no idea how I'm supposed to know what bike to pick. Of course they both feel different than my current bike, but I've been riding that one for 4 years and it's fit to exactly me. So after coming back to the store after riding them and the guys asked how was it, I was like, uh, I don't know, good? They both seem like great bikes. I told Marty to just choose for me. hmm noticed the scott seat post is much more angled back than the p3.. wonder if that would make a difference for you fit wise?? or maybe i'm just not bike saavy! ha. HA! I always tell Jerome - "just make it fast and pink." Well how about that! I used to ride the top one and now I ride the bottom one!! :) Two very different fits (different geometries for sure!) so you may want to ask them to fit you on both and get their opinion on which you fit on better. 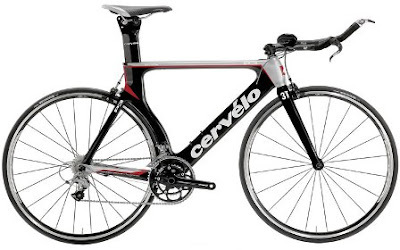 But if you want my opinion on which is a faster bike - go for the Cervelo. It's heavier but it's fast. Dang is that bike fast. Well, I've only had a Cervelo, and of course I like it (because it's paid off! ), but either would be good..that is for sure. Good luck! Or just go by color like these cats suggest!! Ha! I like the first one. Mostly because of the color. I'm sure you'll be fast on both, but go with whatever fits better of course! Ha! That's how I am as well. I can't tell the difference between bikes. Hope you like Marty's decision. Just go get the new Trek Speed Concept Series 9. It's only 10k! Go big or go home right? Watch out everyone...she's on carbon and now she's gonna really smoke us! Good for you...hopefully I'm not too far behind you.